Penryn, CA – July 27, 2016. Davette Fournier, creative director of the Davette’s Lunettes eyewear brand, has announced that she will celebrate the 2nd anniversary of her Davette’s Lunettes eyewear collection launch at Vision Expo West this year on September 15th, 16th and 17th at the Sands Convention Center, Las Vegas, NV. A return to her passions for creation, and with a focus on her unique sense of fashion which is developed from her many years as production designer, choreographer and costuming artist for dance productions across the USA, Davette Fournier brings her creativity into the luxury eyewear sector with promises of her French heritage, and her penchant for classic Parisian flair. Davette’s Lunettes designs are feminine and focused employing all original dense cotton acetates, featuring classic arrays of tattooing, stones and vintage decor. Her unmistakable look recalls classic and vintage moments, while embracing a trendy fashion forward and compelling attractiveness. Each of the limited edition designs in the Davette’s Lunettes ophthalmic collection is hand made, and signed and numbered with a limit of only 250 pieces per color. This effort maintains an important element of desire, surprise, and individuality. Featured models are styles available in cat eye, round and squared off designs, in rich select acetate material and garnished with luxurious colored stones or studs set to compliment the vintage inspired creations. Kingdom Eyewear, owner of Davette’s Lunettes brand, with Davette Fournier, will present the collection at their booth located in the newly designed pavilion Galleria section at #G-23037. 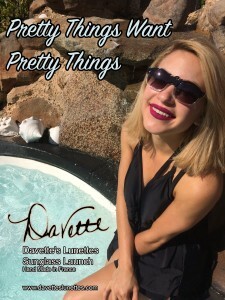 Alongside the addition of her new designs, there will be a campaign to promote the Davette’s Lunettes collection called “Pretty Things Want Pretty Things”, a phrase which brings immediate visuals of beauty and desire. The creation of customized banners and presentation merchandise will embrace the marketing concept, and be available to the stockist of Davette’s Lunettes and include customized printing of their own office or optical boutique name.